NEW YORK (WABC) -- A father who lost his son on the football field is stepping up his fight for better safety regulations. 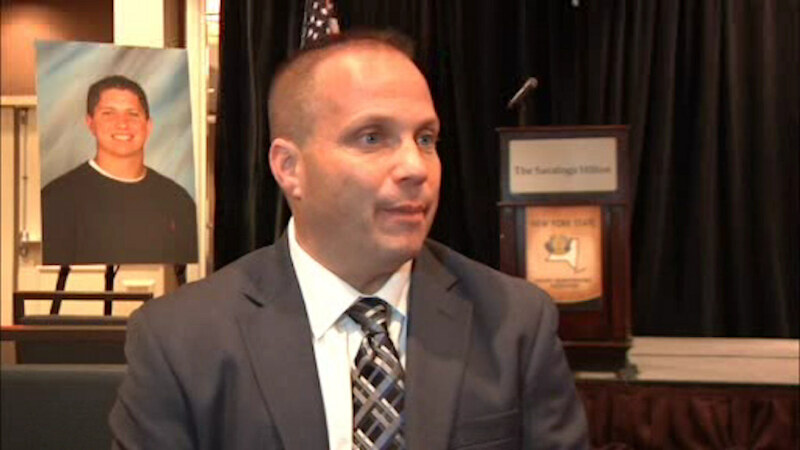 Frank Cutinella spoke Thursday before hundreds of athletic officials from across New York, at a meeting in Saratoga Springs. Cutinella's son Tom died in 2014 after suffering a hard helmet-to-helmet hit while playing for Shoreham-Wading River High School on Long Island. "That's what we're trying to change here, the 'it's just part of the game,' 'well it happens,' well it shouldn't happen and it wasn't meant to happen and adults here at the high school level I think can take some initiatives to make it less likely to happen," Cutinella said. Cutinella wants safety measures like designated safety coaches and stiffer penalties for illegal hits to be adopted statewide.